The Web in Numbers--The Rise in Social Media includes stats on YouTube--100 million monthly viewers in the US and 6.3 billion videos viewed; Facebook--grew from 100 million to 200 million users in less than 8 months, if it were a country, it would be bigger than Brazil; and, Twitter with 7 million unique monthly visitors and a growth rate that will have it at 100 million visitors this time next year. Other important statistic? Social media beats e-mail for top web activity! First time anything beats e-mail. Read the post from Mashable. Digital Public Square in D.C. The Office of the Chief Technology Officer has launched the District of Columbia’s Digital Public Square which puts the citizen in the driver’s seat to discover how District agencies work, participate in the democratic process and connect with your government. This will be the portal for future mashups and data. See dps.dc.gov. Sunlight Labs takes on Redesigning the Government: Data.gov. 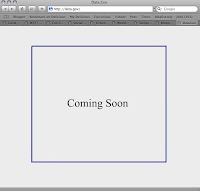 As part of their series redesigning government websites, Sunlight designers/developers prospectively create a design and architecture for data.gov (which today has a "coming soon" sign). They say, "Providing access to government data is one of the clearest ways to be more transparent— and it is our hope that Kundra and team nail this with Data.gov. In order to do so, we’re looking for these things: Bulk access to data, Accountability for Data Quality, Clear and understandable language, Service and developer friendly file formats, and Comprehensiveness." Read all about it at Sunlight.